Aviation Updates Philippines - An A350 XWB flight test aircraft has made its premiere appearance at Doha's new Hamad international airport, on its way to the Singapore Airshow. 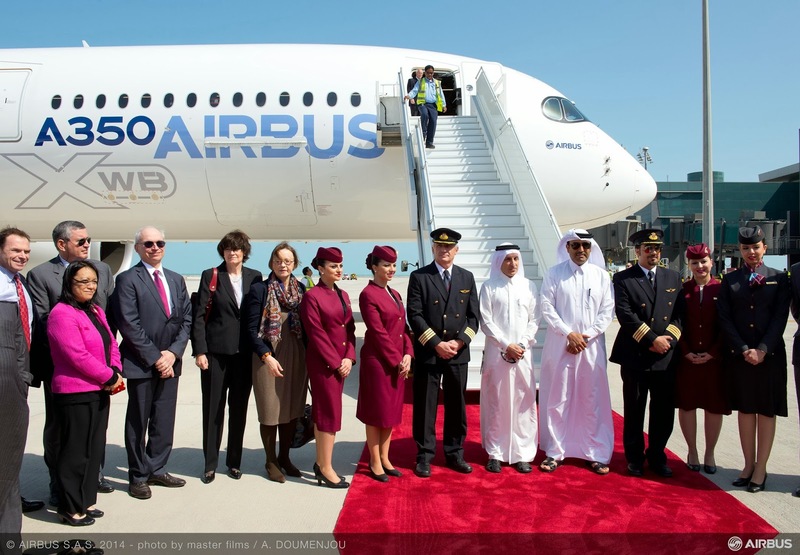 The visit is part of the Entry-into-Service preparations between Airbus and Qatar Airways, the A350 XWB launch customer, who will take delivery of its first A350 XWB in Q4 this year. During the visit, the aircraft was welcomed by Qatar Airways CEO Akbar Al Baker as well as government officials, eager to see the aircraft performing in Qatar's skies. The A350 XWB is an all-new mid-size long range product line comprising three versions. The new Family, whose fuselage cross-section is optimized for full long-range passenger comfort in all classes, will bring a 25 percent step change in efficiency compared with existing aircraft in this size category. To date, the A350 XWB has won 812 orders from 39 customers worldwide.